What’s your communication style when talking to your patients? Do you adopt a fairly formal approach and point out the technical aspects of procedures? Or do you take a conversational tone and invite your patients to ask plenty of questions? Though most dentists are extremely proficient in clinical skills and knowledge, the important ‘soft’ skill of communication is often given far less attention. This can be unhelpful for repeat business and also open up other risks. “Poor communication prevents the development of a trusting dental partnership between patient and dentist, and can lead to an incomplete understanding of patients’ wishes, treatment preferences, medical and dental histories,” says Dr Michael Foley, deputy chair of the Australian Dental Association Oral Health Committee. Physical barriers: These include dentists wearing masks or speaking while leaning over the patient in the dental chair. “This is okay if you’re asking your patient to open their mouth wider, but not okay for giving information about a procedure,” says Dr Foley. “Instead, take your mask off, sit your patient up in the chair, and talk to them at their level. Time constraints: Pushed for time when discussing an upcoming treatment? Then offer to answer any questions or provide further information at a later date if needed. 1. Note their manner of speaking. “Mumbling or not speaking clearly can contribute to loss of communication between dentist and patient,” says Dr Foley. “Asking patients to repeat back what you said can help to clarify their understanding. You can then also paraphrase what they have said to you.” If there are language barriers, Dr Foley suggests using an interpreter service or a friend or family member who can translate. • Missing teeth: “Point out that teeth are a little like books on a book shelf and that when the books are together they hold each other in place, but when one is missing from the shelf the other books may start moving (and teeth may start rotating),” Churnin suggests. 3. Verbally address patient anxiety. 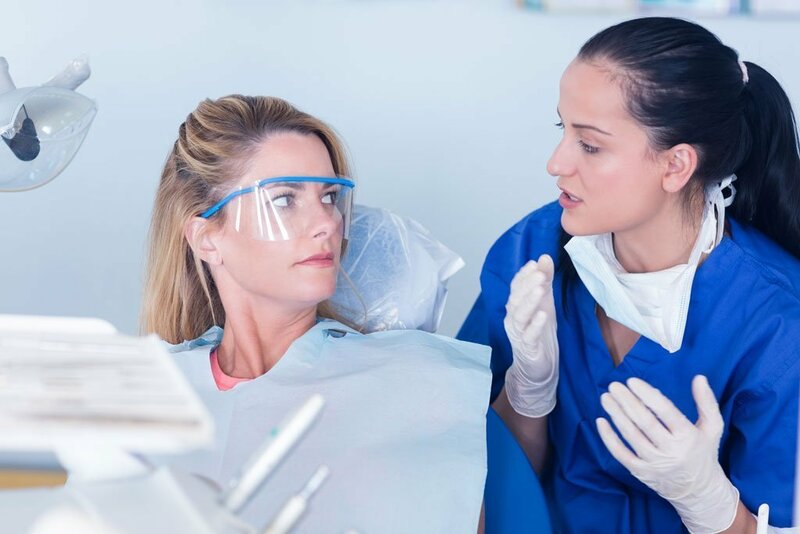 “If your patient is clearly anxious about dental visits, make statements that show empathy, such as, ‘I can understand that this might be confusing or overwhelming’,” says Churnin. Patients want and need their thoughts and opinions to be valued, so it is important that dentists listen to them. Optimal communication involves more than simply a brief outline of what will occur during a dental procedure. In order for good communication to occur, your patient’s needs to feel that you have a relationship. To build this ‘dental partnership’, Dr Foley recommends that you get to know your patient’s background, medical and dental history, priorities and treatment preferences and take a minute to refresh your memory before their appointment begins. 1. Repeat what you have said: Patients don’t recall as much of the advice and agreed actions about future dental care as dentists believe they have discussed. 2. Supply written information: Patients can then take this home to read about their upcoming procedure. Additional advice or discussion points can be noted in bullet points on a notepad, to help jog your patient’s memory when they leave the dental surgery.